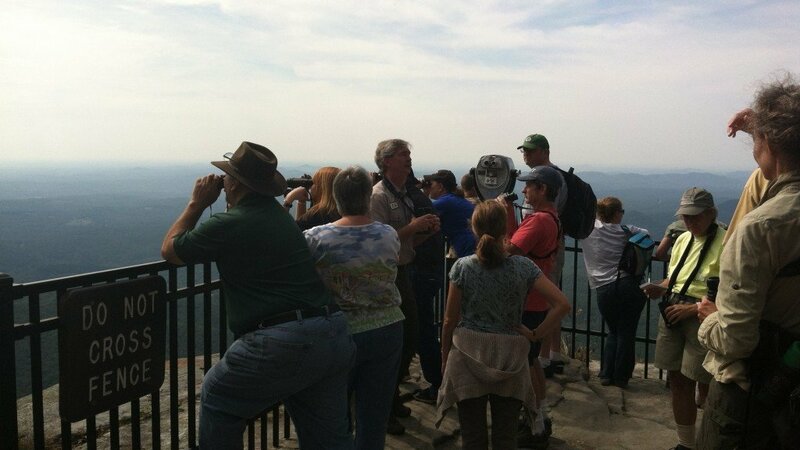 Hawkwatches on the northern half of the Appalachians get a lot of press. There’s Hawk Mountain, Pennsylvania, of course, and that little known Cape May place in New Jersey, not to mention others like Fort Smallwood in Maryland and even Fort Tilden in Queens, New York, which gets some press on the occasions that Corey swings by. But those birds have to go somewhere, even if the concentrations that have come to define the above sites have thinned a little by the time the birds cruise down the mountain range. But there are a couple sites down in this part of the continent where one can sit and enjoy the hundreds of Broad-winged Hawks that flood southward too, and this past weekend I had the opportunity to take one in. This year’s fall meeting of the Carolina Bird Club was held in Greenville, South Carolina, in what are more or less generously considered the South Carolina “high country”. Truth is, the name is mostly earned in relation to South Carolina’s extensive “low-country”, but while the mountains may not measure up in elevation to those in the other Carolina (and I can say that as a self-described North Carolina birding snob), the rolling hills and verdant hardwood forests roll off to the horizon in that quintessentially Appalachian way all the same. I was leading a field trip with a dozen intrepid souls. Our destination was Caeser’s Head, long considered one of the best, if not the very best, hawkwatching sites in the southeast. 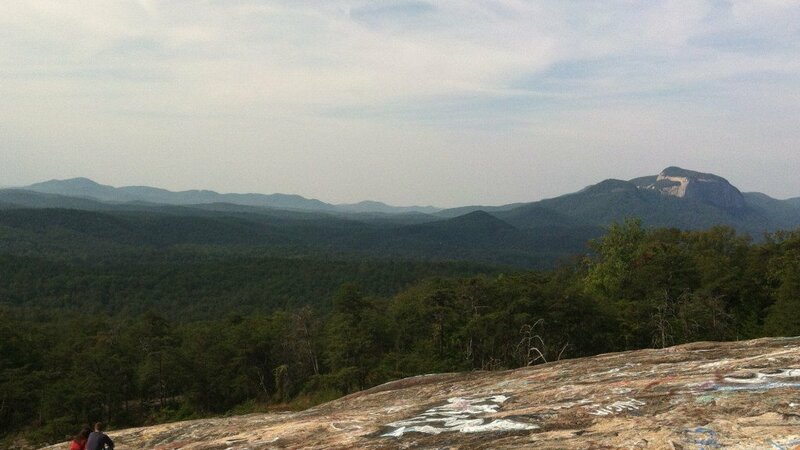 Ceaser’s Head is a granite outcropping that sits about 3200 feet and change over the Blue Ridge Escarpment. On its southward face is a fenced off natural veranda that looks over a forested valley that only seems like wall-to-wall shag carpeting. Needless to say, it’s a great spot for watching the hawks come scooting around the mountain on both sides heading off towards Mexico. On this day we arrived a little early for the big show, but just in time to watch the Broad-wings that had spent the last evening in the forests below us begin to pick and up and kettle for the day. It’s an incredible thing to watch. You step out on the rock and see nothing but for the lazy circles of Turkey Vulture. Suddenly, the forest around you begins to shake as birds, mere pinpricks at first, launch themselves into the sky and start their slow ascent. Eventually these specks below the horizon coalesce into funnels of birds above the horizon. It’s 90% Broad-wings, paddle-shaped with crisp tail bands, but there are a handful of Sharp-shinned Hawks mixed in too, looking for all the world like the flying gavels described in every hawk-watching tome. It’s the sort of thing you don’t really internalize until you see them soaring, awkwardly but adequately, alongside the Broadies that seem completely meant for this locomotion. And they just keep coming. 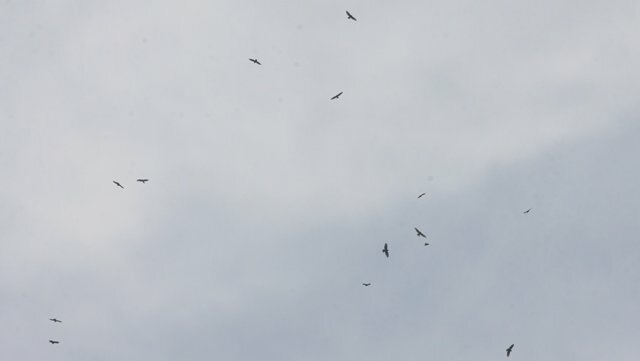 We say around 400 hawks take off in the first hour we spent at the platform, most of them in two very large kettles. I realize 400 in an hour is a fairly pedestrian count at some hawkwatches, but it’s still a spectacular thing to witness. And there isn’t a single minute in that hour that there isn’t a Broad-winged Hawk in sight which is fairly remarkable to think about. Needless to say, the trip participants went away suitably impressed. My job as trip leader was an easy one. In addition to the Broad-wings and the few Sharpies, the resident Red-tailed Hawks made a couple quick passes inducing “ooohs”, and “ahhhhs” among the assembled. A Peregrine Falcon soared around to the west before stooping in the forest in a particularly dramatic way, which was exciting. The trip list at this site was low, but the total biomass was high in that way that good hawkwatches are. And Caeaser’s Head is definitely good. It has earned the right to stand among the big boys, and is well worth your time should you find yourself in western South Carolina on a windy September day.